The Regal Critiques: Coraline: Which is Better- the Book or the Movie? 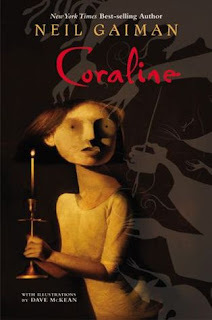 I've always toyed with the idea of picking up Coraline- the book, or watching the movie, but never did get around to either. 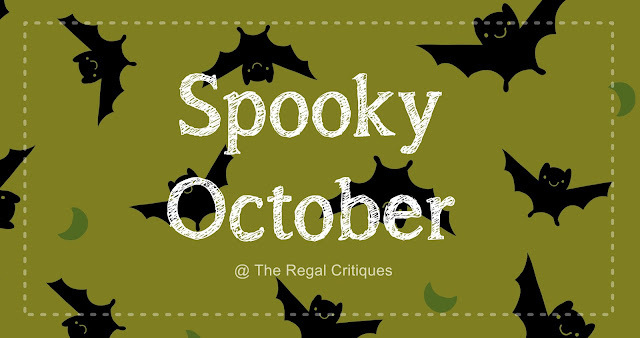 However, in light of this being Spooky October and on Vera's recommendation, I decided to try not one but both and do a comparison review of sorts- so here we are! 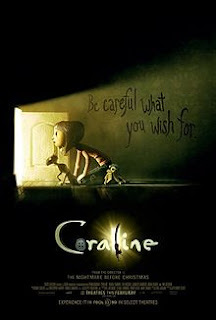 Coraline, the 2002 book by Neil Gaiman, and the 2009 movie of the same name are both about a little girl who has just moved to a new house with her parents. Stuck in the house and quickly running out of ideas to entertain herself when her parents are too busy to pay any attention to her, Coraline stumbles upon a locked door in her drawing room. When she manages to get her mother to open it for her, Coraline discovers that there's nothing but a brick wall behind it. However, on later discovering that the bricks have disappeared, Coraline walks through the door to enter a world that is identical to her own...but not quite. The people have buttons sewed on where their eyes should be, and they might not have the bestest intentions- the woman who calls herself Coraline’s “Other Mother” is hellbent on trying to bribe Coraline into staying there forever, and the rest of the story is basically all about Coraline's fight to keep her evil Other Mother at bay. As different as they may seem, both the book and the movie are pretty much the same where the plot is concerned, but with a few striking differences. The movie sees a new character introduced in the form of Wybie, a litle boy who acts as Coraline's companion. While his character may not seem important in the long run, he still had a fair number of moments to shine and even play hero. The movie also includes a strange doll that looks like Coraline, which we later learn was made by the Other Mother to spy on Coraline- this was entirely absent in the book. Having a doll in the movie worked in favor for it, because it helped make the story make more sense, and also gave it even more of a creepy edge. The parents don't have much of a role, and they are quite very similar in both the book and the movie- very inattentive to Coraline's woes and lost in their worlds- and the same can be said of the quirky, eccentric neighbours- Misses Spink and Forcible, and Mr. Bobinski- who never get Coraline's name right. Coraline is quick-witted, plucky and...well, whiny. I really liked her, but she spent a huge part of the book and movie whining and sulking about everything in general- something that made me lose a bit of my patience, especially in the movie where she came off as bit more selfish and sulky. It's understandable that being stuck in a house with nothing to entertain yourself can do that to people, especially to little kids, but it still was a tad annoying. One more character (if I may call it that) which I like more in the book than in the movie was the cat. While it was snarky in both versions, I liked the book version more because it felt more real somehow and endearing- rude though it was. The ghost children had slight changes in the movie too, but the book did them better I felt, especially towards the end. The climax again, saw small changes, and I liked the movie version more because it felt more dramatic whereas the book ending felt a teeny bit lacking. The film adaptation was made using stop-motion animation, which I think was a great choice. Regular animation wouldn't have served the right amount of creepiness that this did, and using actual people in the movie would have proved to be too horrifying, especially considering the target age- stop-motion helped translate the creepiness from the book perfectly without making things too scary. One other thing that absolutely must be mentioned is the music- the background score was brilliant and helped create the perfect atmosphere for the story, while the songs helped enhance the experience. While I'm normally a staunch supporter of Camp Book-is-Better, this time I'll have to say the movie was better. The book felt too short at 162 pages, and while this was probably because it's targeted at younger readers, I felt the author could have come up with something even better, paying more attention to detail, if he had made the book longer. In fact, Veronika pretty much summed up my thoughts in her review when she said "this is the kind of book that will make you desperately wish you were a child again just to devour the novel at the age the book was aimed at". The movie, on the other hand, managed to captivate me from the start to the end, and the details that had gone into each scene worked in great favor of it. The movie built a rather more captivating world and characters while still sticking to the original story line and isn't that just exactly what we look for in adaptations? It offers so much visually and the minor changes only served to improve things where the book failed at times. This is not to say the book isn't great though- the author has a way with words that's very engaging and the book is very much worth a read if only for the brilliant writing. However, if you want to give only one of these a chance, I'd say go ahead with Henry Selick’s fantastic adaptation already! ...Or have you read/watched Coraline already? Did you like it as much as I did or possibly even more? What worked for you in the movie version that I failed to mention? Let's talk in the comments below! The cat was one of the best things about the book ahaha, and yes, I do agree the book was super creepy- and the illustrations contributed hugely towards it! I’ve only ever seen the movie and despite how creeped out I was, I actually thought it was pretty cool! I think the book may be a bit too boring for me though. I haven't read Coraline yet but I just rewatched the movie and I agree with you that the stop-motion animation choice made the entire movie! If it was regular animation, especially in that day in age, I think it would have come off as too 'clean' whereas the stop-motion makes it really creepy (I was creeped out by it and it's rated PG!). I really do need to read the book one of these days! Great post, Ruz!